Sao Paulo (AFP) - Thousands took to the streets in cities across Brazil demanding that embattled President Dilma Rousseff -- facing a weak economy and calls for her impeachment -- be removed from office. Rousseff is fighting for her political life as she stands accused of illegal budgeting maneuvers that she says were long-accepted practices by previous governments. A one-time political prisoner during the 1964-1985 military regime, Rousseff derides the attempt to bring her down as a "coup." "Time has shown that Dilma is unable to govern. She's thrown the country down a well," argued Adriano de Queiroz, 36, a protester in the capital, Brasilia. One small bit of good news for Rousseff was that turnout at the rallies, seen as a barometer of the national mood, was lower than expected. The turnout hit a total of about 83,000 across 87 cities, the Globo G1 news website cited police as saying. Organizers disputed that figure, saying that 407,000 had marched in protest. Either way, the figures are sharply lower than the 2.4 million anti-Rousseff marchers that took to the streets on March 15, or the nearly 900,000 that marched in mid-August. Just days ago, pro-Rousseff and opposition lawmakers shoved and screamed at each other in Congress during a vote to form an impeachment commission. But protesters in the streets were much calmer Sunday. In Brasilia, thousands marched peacefully behind a giant inflatable Rousseff dressed up as Pinocchio. 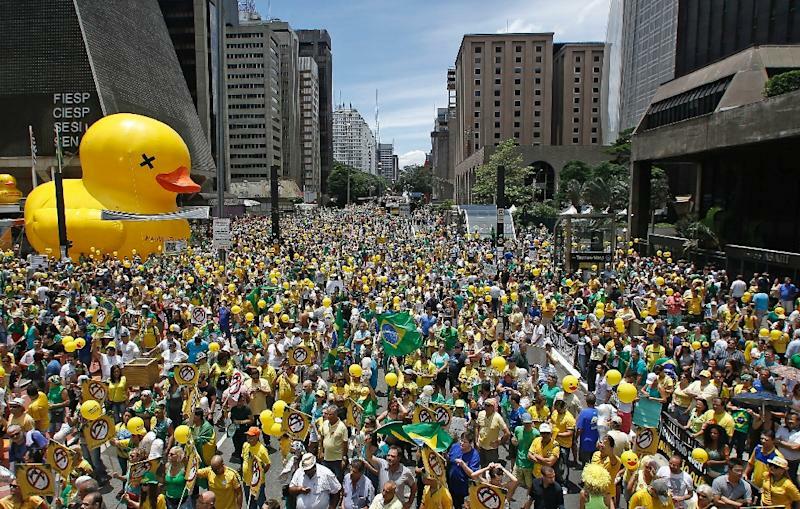 And about 30,000 rallied in the country's wealthy industrial and financial hub Sao Paulo, G1 reported. It was the fourth time this year that demonstrators across the sprawling nation of 204 million marched to demand the removal of the country's first female president. Organizers blamed the weak turnout on calling the march with just 15 days notice. "We were expecting fewer people (on Sunday) because in the other marches we had two to three months to organize ourselves," said Kim Kataguiri, national coordinator for the Brazil Libre protest group. 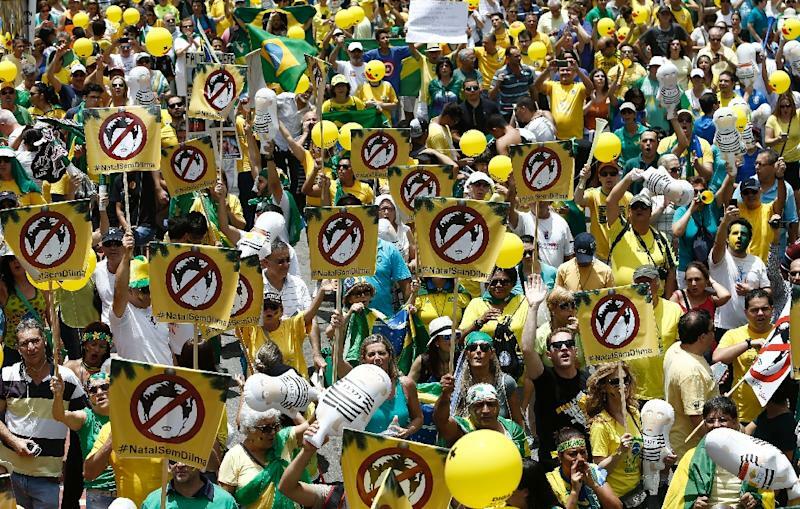 Kataguiri told AFP at the Sao Paulo rally to expect much larger protest marches next year. 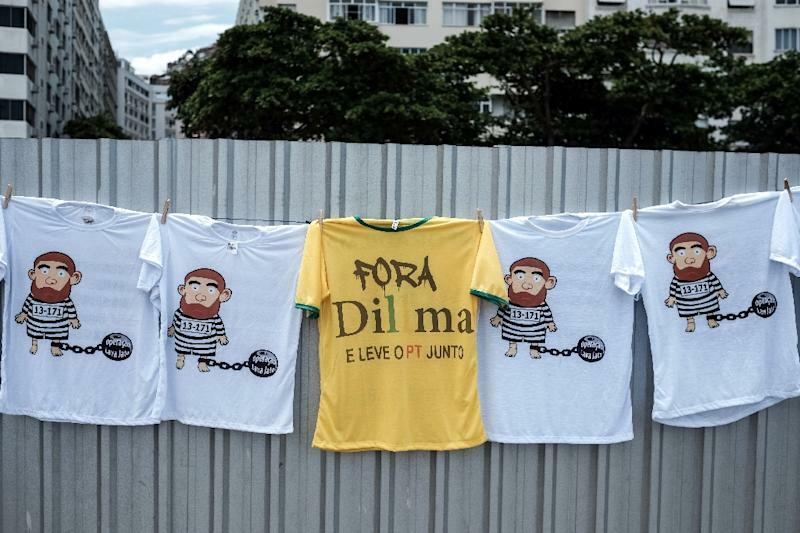 The turmoil is stirring strong passions in Brazil, where Rousseff's leftist Workers' Party has been in power since 2003 with the help of its ally PMDB. The protests come as Brazil prepares to host the 2016 Summer Olympics in Rio de Janeiro, the first time the Games will be held in South America. Political uncertainty is adding to the country's economic woes, with GDP down 4.5 percent in the third quarter year-on-year, and the national currency down a third against the dollar this year. A vast corruption scandal centered on state oil giant Petrobras has also undermined investor confidence. In the latest sign of the dismal economy, the government announced year-on-year inflation for November of 10.48 percent, the highest in 12 years. With her approval ratings at only 10 percent, Rousseff has little political support to mount a defense. The impeachment push in part reflects the country's anger at multiple crises, including the high-profile Petrobras scandal. On Tuesday, the Supreme Court suspended for one week the commission that will recommend whether or not Congress should impeach the president, citing irregularities. Of the 65 lawmakers elected in controversial circumstances to the panel, about 30 percent face criminal probes, according to a detailed count by specialist website, Congresso em Foco. The architect of the impeachment drive himself, House Speaker Eduardo Cunha, has been charged with taking as much as $40 million in bribes. He allegedly stashed the money in secret Swiss accounts. Analysts say that the entire impeachment crisis has in part been linked to Cunha's battle to distract attention from his case and ensure his continued influence as speaker.